Bienvenidos: Latino Mural Site "Adelante"
The Mexican-American community of Sterling, Illinois proudly presents Adelante, a five-panel mural depicting nearly 100 years of local history. Latina and Latino volunteers coordinated with other organizations to assure that this project would be completed before the year 2000. 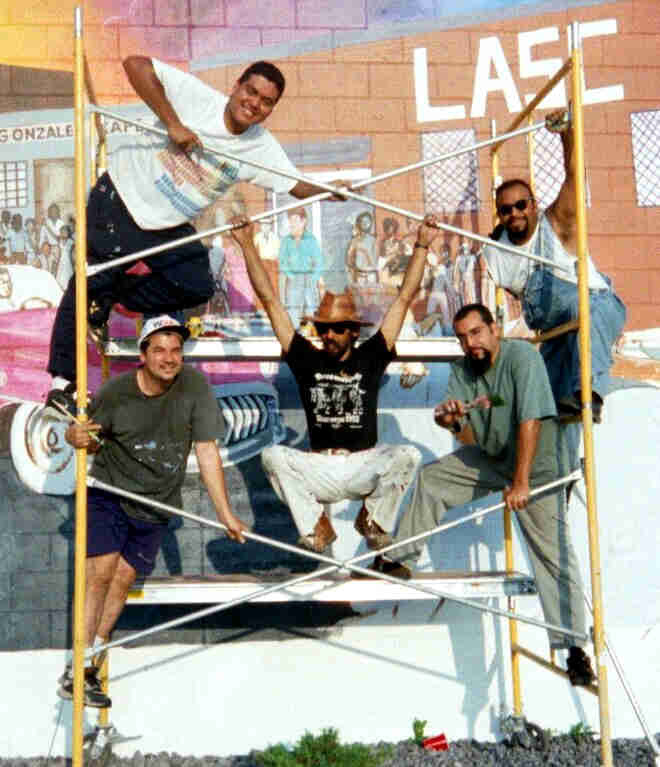 Together with the Mural Society, the Sterling-Rock Falls Historical Society, and a team of Chicago Latino artists, the community advocates planned this ambitious project which was completed in September 1999. Adelante faces Sterling's "West End," the barrio where immigrants first settled near the railroad and steel mills, gradually building homes northward and westward to expand Sterling's boundaries. Nine earlier murals depicted the settlement and development of Sterling, yet overlooked significant contributions of Mexican and Puerto Rican residents throughout the 20th century. See MURAL THEMES for details of Adelante Mural. The Chicago artists poised on the scaffold are, clockwise from top right: Javier Gonzáles, Roberto Valadez, Jesus González, Bill Campillo and Santiago Juarez (top left). Latin American flags on the mural's side panels reflect the diversity of Latinos in the Sterling community and across Illinois. 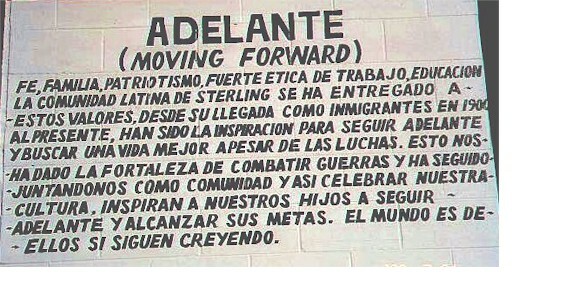 The meaning of Adelante and the mural's message is highlighted in both Spanish and English on the side panels. This website was last updated on 04/08/06.